SELECT A HUB FOR EACH OF THE 8 OCTANTS. 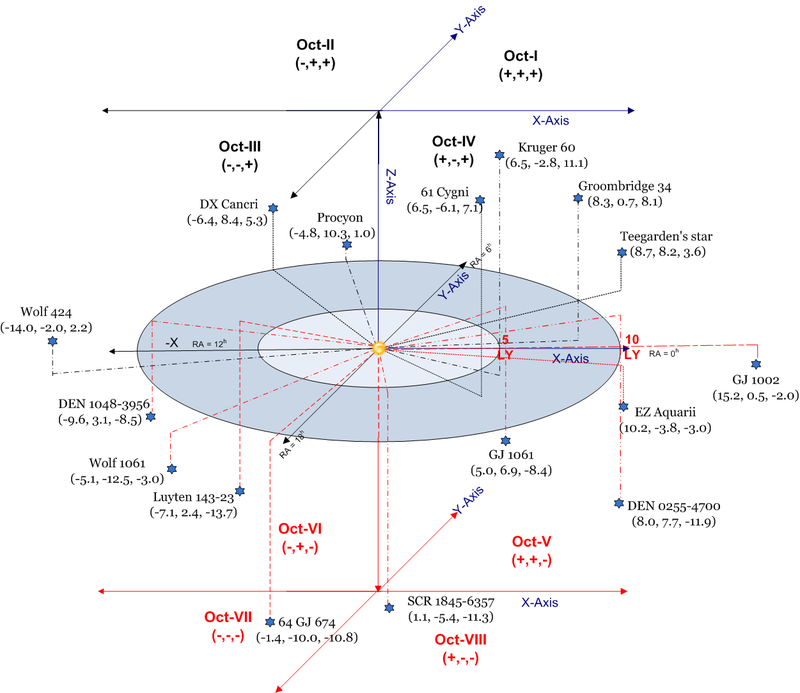 OCTANTS:TE's way of displaying our neighboring stellar systems. Thus, far humanity has discovered about 51 such systems within 15 LYs of Sol. BEARINGS can help vessels precisely track remaining distance. This will prove essential for decelerating at exact, required distance to destination. Furthermore,quickly determine 3-D distances between any two points by further leveraging P-Theorem on the coordinate differences. 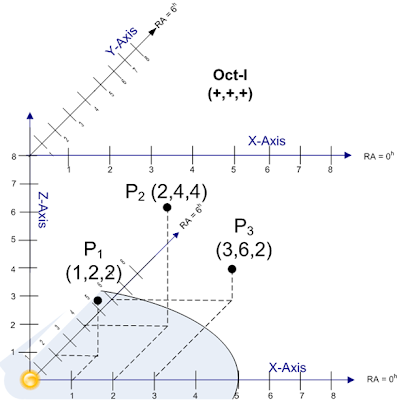 EXAMPLE: compute 3-D distances from P1 in following manner. Sol's neighbors in Octant One. are readily obtained in decimal degrees. by carefully measuring brightness and parallax. Determine two legs of voyage to interstellar destination. and Leg-2 distance is from hub to destination, T-Star . Use Pythogorean Theorem to obtain leg distances.. Consider Hub Concept Instead of direct to all stars, use a well situated star as stop over "hub" for its neighbors. Thus, interstellar voyages could transit this hub enroute to other destinations. 1) PROXIMITY: Closeness to Sol reduces flight time. 2) WELL SITUATED: Position among other stars is very useful. 3) WELL PROVISIONED: In situ materials (comets and asteroids) could resupply transit vessels. for insterstellar g-force travel times (Yrs). One long voyage can divide into two shorter flights; use a well placed star as a hub between Sol and subsequent destinations. Thus, a stopover flight profile might prove more tolerable and probably much more useful than direct flights to the more distant neighbors. Stopover flights make even more sense if the "hub" has plentiful "in situ" resources (comets/asteroids) to build and provision other star ships. From each octant, select most suitable star as a hub. Transform into three dimensional (3D) Cartesian Coordinates. X, Y and Z in LY. 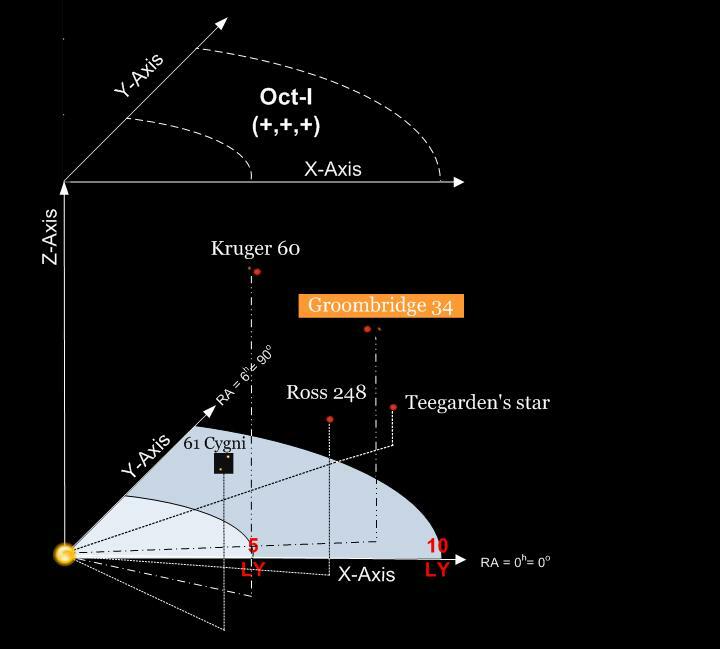 Assume Common Ecliptic Plane (CEP) as base for X-Y plane. with 1 year deceleration (accomplished during final distance of .37 LY prior to destination). 3) provision of on site resources. Hub's stellar names are placed to conveniently designate parent octants; they are not placed to show exact location within each octant.